English football legend Alan Shearer helped launch a team of cyclists on an epic 1,000 mile challenge on behalf of the Sir Bobby Robson Foundation – of which he is patron – this week. The star met with 6 British men as they set out to bike from Chile’s Pacific coast to Argentina’s Atlantic coast to raise funds for the charity, named after late football boss Bobby Robson, who passed away in 2009. Sir Bobby created the Foundation not only to provide early cancer detection and treatments, but also to provide clinical trials of new drugs at the Northern Centre for Cancer Care in the Freeman Hospital in the UK. Established in 2008, the initial goal of the Foundation was to raise £500,000 to fund equipment for a cancer research centre being built in the Freeman Hospital, Newcastle upon Tyne, but soon grew to encompass much more. 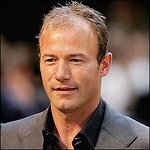 Alan Shearer is no stranger to extreme bike challenges – he biked from Newcastle to London via West Bromwich with Adrian Chiles in 2008 for Sport Relief. The bike challenge will take 12 days, and already hit problems when one of their bikes never arrived in Chile.